I’ve been up to my eyeballs with web projects lately, which is a good thing! This set was something I put together a few weeks ago and never got a chance to release. So without further a due, I present “Eearthen Angel Free Etsy Banner Set”. It comes with 4 avatars, 4 banners, Reserved, Custom Order and Thank you placeholder images. 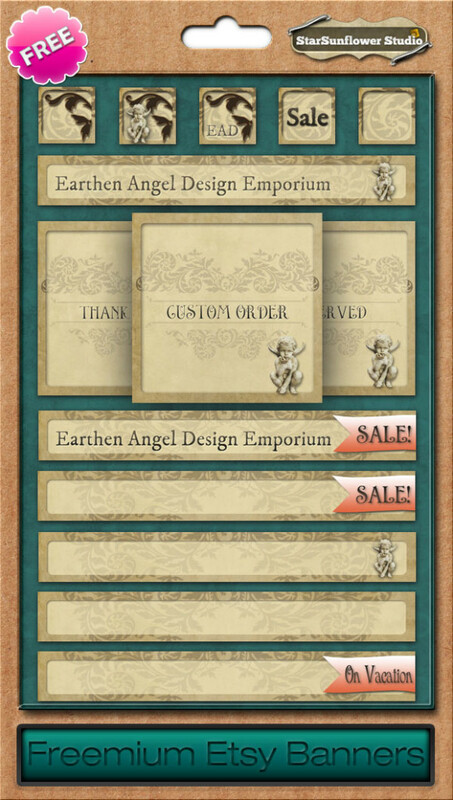 The “Earthen Angel Design Emporium” part is just a preview so you know what the banner will look like with a store title inserted. This set was originally going to go up for sale in a new Etsy Shop I created for graphic design items, but I decided to release it for free. I’ve neglected my own Etsy store, lol. ~ If you are interested in a custom personalized banner set or further customization of this one, text addition, etc. Feel free to contact me with any special requests. If you are looking for more banners, check out 39 Awesome Free Etsy Banners and 40 More Awesome Free Etsy Banners posts as well. There are quite a few designs to choose from. Just want to share this site with free ui materials, that I found recently. Pretty banners! This website is gorgeous. Many thanks for sharing so much art and such beautiful things!